The original Ford Cologne V6 is a series of 60° cast iron block V6 engines produced continuously by the Ford Motor Company in Cologne, Germany, since 1965. Along with the British Ford Essex V6 engine and the U.S. Buick V6 and GMC Truck V6, these were among the first mass-produced V6 engines in the world. Throughout its production run, the Cologne V6 has evolved from the engine displacements of 1.8, 2.0, 2.3, 2.4, 2.6, 2.8, 2.9, and 4.0 litres engines. All except the Cosworth 24v derivative and later 4.0 litre SOHC engines were pushrod overhead-valve engines, with a single camshaft between the banks. Originally, the Cologne V6 was installed in vehicles intended for Germany and Continental Europe, while the unrelated British Essex V6 was used in cars for the British market. Later, the Cologne V6 largely replaced the Essex V6 for British-market vehicles. These engines were also used in the United States, especially in compact trucks. 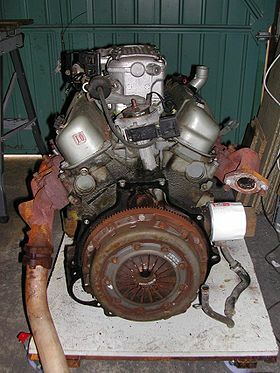 The Cologne V6 was made to be very compatible in installation with the Ford Taunus V4 engine, having the same transmission bolt pattern, the same engine mounts, and in many versions, a cylinder head featuring "siamesed" exhaust passages, which reduced the three exhaust outlets down to two on each side. The latter feature was great for compatibility, but poor for performance. The 2.4, 2.9, and 4.0 had three exhaust ports, making them preferable. The engine was available in both carburetted and fuel-injected forms. The smallest version of the V6 was the 1.8 L; 110.6 cu in (1,812 cc) with a 80 mm × 60.14 mm (3.15 in × 2.37 in) bore and stroke. Its output was 82 PS (60 kW; 81 hp) and 135 N⋅m (100 lb⋅ft). Its only application was the Ford 17M P7 from 1968 to 1971. The original displacement of the V6 was 2.0 L; 121.9 cu in (1,998 cc) with a 84 mm × 60.14 mm (3.31 in × 2.37 in) bore and stroke. Output was 85 PS (63 kW; 84 hp) and 151 N⋅m (111 lb⋅ft) or 90 PS (66 kW; 89 hp) and 158 N⋅m (117 lb⋅ft). The 2.4 L; 146.1 cu in (2,394 cc) was used only in Europe. Like the 2.9 L version, the camshaft is chain-driven, it has fuel injection system (EFI) and Ford's EEC-IV engine management. Bore and stroke is 82 mm × 74 mm (3.23 in × 2.91 in). Power output is 125 PS (92 kW; 123 hp) at 5800 rpm and 184 N⋅m (136 lb⋅ft) torque at 3500 rpm. The largest first-generation V6 was the 2.6 L; 155.6 cu in (2,550 cc) introduced in 1969. It had a 90 mm × 66.8 mm (3.54 in × 2.63 in) bore and stroke. Output was 125 PS (92 kW; 123 hp) and 205 N⋅m (151 lb⋅ft). A special high-performance version had 2.6 L; 160.9 cu in (2,637 cc) with a 90 mm × 69 mm (3.54 in × 2.72 in) bore and stroke. With fuel injection, it produced 150 PS (110 kW; 148 hp) and 219.5 N⋅m (162 lb⋅ft). It was the only first-generation engine with fuel injection. Its only application was the Ford Capri RS 2600 where it was used from 1970 to 1973 when it was replaced with the RS 3100. Weslake developed a racing version of the engine, bored to 96 mm (3.78 in) to give 3.0 L; 182.8 cu in (2,995 cc) of displacement and producing in excess of 320 PS (235 kW; 316 hp). The second-generation Cologne V6 was introduced in 1974. It displaced 2.8 L; 170.4 cu in (2,792 cc) with a bore and stroke of 93.03 mm × 68.5 mm (3.66 in × 2.70 in), and used a geared camshaft design. The European version used a "siamesed" two-port exhaust manifold, similar to the one used on the V4, while the American version used three-port heads. The European approach was useful in that existing cars with the V4 engine could be upgraded with relative ease. Output was rated at 90 to 115 bhp (67 to 86 kW; 91 to 117 PS) for the US market and 130 to 160 PS (96 to 118 kW; 128 to 158 bhp) for the European market, depending on the model. In Europe, the 2.8 was produced with carburetor 132 PS (97 kW; 130 bhp), mechanical fuel injection (Bosch K-Jetronic, 160 PS (118 kW; 158 bhp), and electronic injection (Ford EEC-IV, 150 PS (110 kW; 148 bhp)). Electronic injection only featured on the 2.8 Granada models for one year before being replaced with the 2.9 unit. Tuning options are very limited with the Bosch K-Jetronic models. The siamesed inlet and exhaust ports of the 2.8 only respond well to forced induction or an overbore; normal tuning will yield only minor power results. The MFI 2.8 Cologne (Capri/Sierra 2.8i) uses a very restricted induction setup, and no open air kit is available due to this. Ford offered a limited run of approximately 150 "Capri turbos" with turbocharged 2.8 engines. These engines displayed RS badging and used a productionized version of an existing aftermarket kit offered by a Ford dealer in Germany. TVR Tasmin/280i used the Cologne 2.8 with Bosch K-Jetronic fuel injection, as did the early TVR 'S' series in 2.8 and revised 2.9 efi injection form. Above view of a 2.9 litre; front is to the right: Note the pronounced stagger of the cylinder banks. This is a fuel-injected engine. The plenum chamber is silver, and the fuel rail is painted green. View of a 2.9 litre from the rear, flywheel side: Note the 60° between the cylinder banks. Left side of a 2.9 litre: Unlike the 2.8, the 2.9 does not merge the three exhaust ports into two manifold pipes. The 2.9 L shares the same basic design as the 2.8 L model, bar a few subtle differences. The camshaft is chain-driven rather than gear driven, so it rotates in the same direction as the crankshaft. The arrangement of the exhaust valves is different, eliminating the "hot-spot" that existed on the 2.8 L model. The cylinder heads also sport a more conventional three-port exhaust manifold. Output was rated at 140 hp (104 kW; 142 PS) at 4600 rpm and 170 lb⋅ft (230 N⋅m) at 2600 rpm for the light trucks (1986-92 Ranger and 1986-90 Bronco II) and 144 hp (107 kW; 146 PS) at 4800 rpm for the Merkur Scorpio in the US market and 150 to 160 hp (112 to 119 kW; 152 to 162 PS) for the European market. Bore and stroke was 93 mm × 72 mm (3.66 in × 2.83 in) for a total displacement of 2.9 L; 179.1 cu in (2,935 cc). In Europe, this engine was commonly fitted with the Bosch L-Jetronic fuel-injection system, married to Ford's EEC-IV engine management. Because of this difference over the 2.8 L model, this version was a more popular candidate for aftermarket modification (typically turbocharging) from companies such as Janspeed and Turbo Technics. A special twin DOHC (QUAD CAM) version of the 2.9 was created by Cosworth Engineering in 1991. Although it shared the same block as the standard 2.9, power output was up to 195 PS (143 kW; 192 hp) and torque was boosted to 275 lb⋅ft (373 N⋅m) at 4500 rpm. 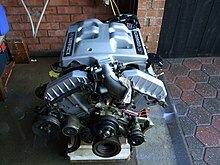 This engine (code BOA) was used in the Ford Scorpio Cosworth 24V. This engine configuration was only paired with an improved A4LDe automatic gearbox with partial electronic shift control. No manual gearbox was offered from the factory. The standard Ford-issued block was machined differently to improve strength. In place of the single-cam arrangement, an endless duplex hydraulically tensioned timing chain was used to drive the overhead cams. The chain measured 2.2 m (7 ft 3 in). The casting and bearings for the standard underhead cam were repurposed for a shaft which drove the oil pump. Ignition was controlled by a EDIS-6 system, which would become a standard feature. The engine was known for its substantial increase in power delivery above 4000 rpm relative to the unmodified version; in recent years, the engine has become a popular choice as a replacement engine for the Ford Sierra XR4x4 and XR4i. 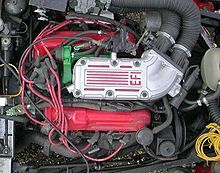 An improved version of this engine (code BOB) was available in the restyled 1995 Ford Scorpio. Differences included two simplex chains with two hydraulic tensioners and the addition of a variable-length intake system called VIS. Power output was increased to 210 bhp (157 kW; 213 PS). This was mated to a fully electronically controlled A4LDE automatic transmission. The pushrod 4.0 / 4.0 L; 241.5 / 244.6 cu in (3,958 / 4,009 cc), with a bore and stroke 100 mm × 84 mm (3.94 in × 3.31 in) version, although produced in Cologne, Germany, was only fitted to American vehicles. The OHV engine was produced until 2000 and was used in the Ford Explorer, Ford Aerostar, Mazda B4000, and Ford Ranger. Output was 160 hp (119 kW; 162 PS) and 305 N⋅m (225 lb⋅ft). Though some variation exists, typically 155 hp (116 kW; 157 PS) is quoted as horsepower for 1990-92 applications. The SOHC version was introduced in 1997 in the Ford Explorer, alongside the original pushrod version. It features a variable length intake manifold and produces 210 hp (157 kW; 213 PS) and 254 lb⋅ft (344 N⋅m)f. (The variable length intake manifold was discontinued in 1998, replaced by a standard intake.) It uses a jackshaft in place of a camshaft to drive a timing chain to each cylinder head. Three timing chains are used, one from the crank to the jackshaft, one in the front of the engine to drive the cam for the left bank, and one on the back of the engine of to drive the cam for the right bank. Ford has since phased out the engine in favor of the more powerful and efficient Duratec 37. The 4.0 SOHC engine was notorious for the OEM timing chain guides and tensioners breaking resulting in timing chain rattle or "death rattle". This problem can occur as early as 45,000 mi (72,000 km) in some vehicles. When the engine is run for an extended period of time with this issue, the engine can jump timing, damaging the heads and valves. Timing chain rattle was mitigated in later years of the SOHC (in most vehicles, after 2002) with updated cassettes and tensioners. This problem occurs with varying frequency among some Ford vehicles equipped with the SOHC engine, including the Ford Mustang, Ford Explorer, and Ford Ranger. The 4.0 OHV was not affected by this issue. A version of the engine is used in the Land Rover LR3 and Ford Courier in Australia and Canada, producing 216 hp (161 kW; 219 PS) and 250 lb⋅ft (339 N⋅m) of torque at 3,000 rpm. The Land Rover version of the engine became unavailable in the United States for the 2008 model year. A number of companies have produced forced induction versions of the engine. Janspeed produced single and twin-turbo 2.8 and 2.9 engines. Sprintex produced 2.8 and 2.9 supercharged engines. Explorer Express has also developed a series of Eaton Roots-type supercharger systems producing from 6–11 psi (0.41–0.76 bar) of boost for the 4.0 engine. As well, Moddbox produces a kit to adapt an Eaton M90 supercharger originally from a Thunderbird Super Coupé to the 4.0 SOHC engine. An Eichberg 2.8i turbo was also available. In 1991 increased capacities for the 2.8 and 2.9 engines (3.5 and 3.7 litres, respectively), were first developed and introduced by D.P. Davies and sold by his company, VeeTech Engineering now RND Engineering in the UK. Two companies still produce large capacity conversions on the 2.8 & 2.9: Power Engineering and Specialised Engines. Wikimedia Commons has media related to Ford Cologne V6 engine. ^ "Cologne V6 engines". ford-ig-wriede.de. Retrieved 2015-07-21. ^ "Timing chain rattle resolution process - SOHC V6 ''ExplorerForum''". ExplorerForum.com. 2010-04-25. Retrieved 2018-06-18. ^ "Land Rover LR3 Review ''Edmunds''". Edmunds.com. 2010-08-11. Retrieved 2011-01-06. Anderson, Doug. Rebuilding The Ford 4.0L Pushrod V6, Engine Builder, April 2001. This page was last edited on 6 April 2019, at 16:43 (UTC).